Deborah Westler, left, and Diane Freggiaro are the co-managers of the bookstore run by the Friends of Lodi Public Library. 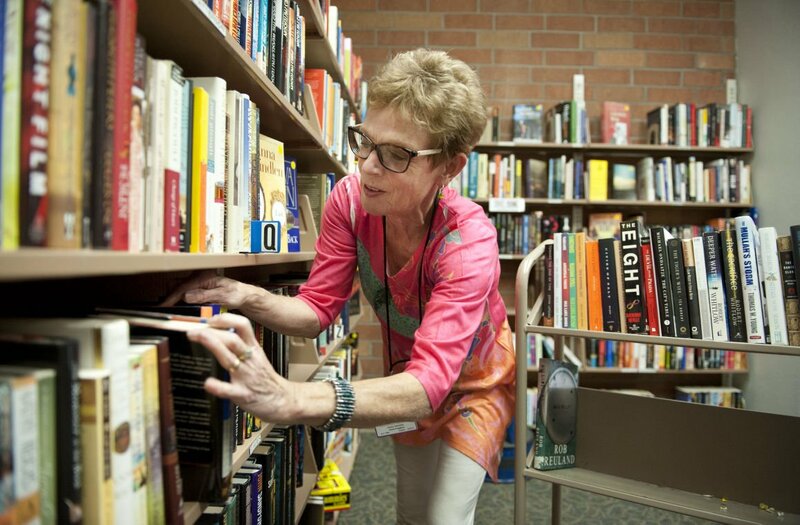 Friends bookstore co-manager Diane Freggiaro sorts books at the Lodi Public Library in Lodi Thursday, Oct. 15, 2015. Raquel McFarland, of Lodi, shops for books at the Friends bookstore at the Lodi Public Library in Lodi Thursday, Oct. 15, 2015. 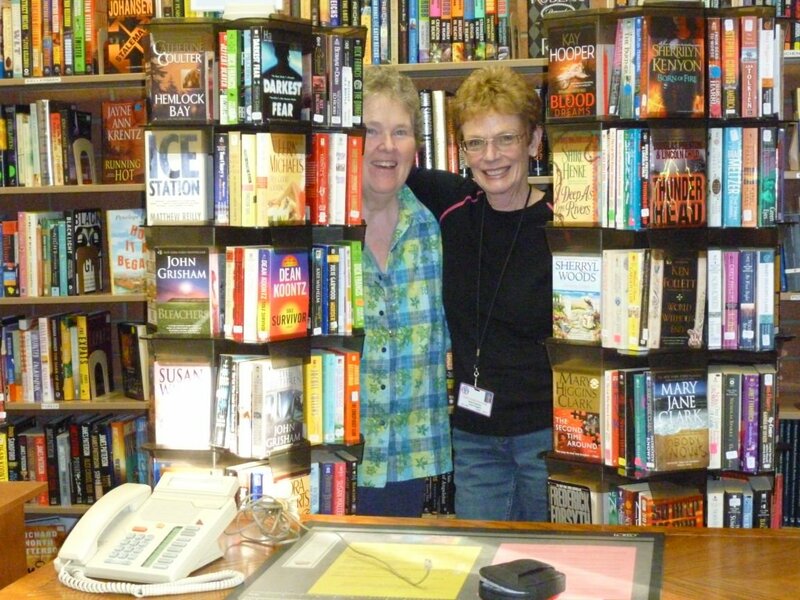 Friends bookstore co-manager Diane Freggiaro and volunteer Lynde Schengel- Perry (top) sort books at the Lodi Public Library in Lodi Thursday, Oct. 15, 2015. Friends bookstore co-manager Diane Freggiaro prices a book at the Lodi Public Library in Lodi Thursday, Oct. 15, 2015. The Friends of Lodi Public Library run the bustling bookstore off the hallway leading to the community room as well. Business is booming, with the bookstore bringing in between $2,000 and $3,000 a month, vice president Diane Freggiaro said. But these volunteers — more than 60 of them at the last count — do a lot more than just sell paperbacks and picture books. Sunday marks the beginning of National Friends of Libraries Week. The week’s purpose, according to the American Library Association, is to raise awareness of Friends groups and recognize volunteers for the work they do. In Friends of Lodi Public Library’s case, that’s a lot of work. One of their main objectives is to raise funds for new equipment and projects for the library. In 2014, the group raised more than $20,000, including $5,000 to redesign the library’s website and $2,500 for a self-checkout in the children’s section. Other funds go toward the library’s programs, from crafts classes and children’s shows to the permit that allows the library to show free movies. Most recently, the Friends filmed a 15-second advertisement and paid for it to be shown before movies at Lodi Stadium 12. The ads will begin on Nov. 20. “It’s our attempt to reach a different audience,” Freggiaro said. Most of the funds for these projects come from book sales, both in the Friends Bookstore and at special events like Saturday’s Woodbridge Chili Cook-Off. When someone has books in good condition, magazines from the current year, or audio and video materials in their original packaging, they can ring the bell at the library’s back door to donate them. A Friends volunteer can give them a donor receipt. Then, the books head to the processing area, where they are cleaned, evaluated and sorted. Books in bad condition, homemade audio and video, old magazines, encyclopedias and textbooks older than 5 years old are weeded out. Once they’re cleaned and ready to be sold, they go to a separate shelf near the door leading to the public areas of the library. As space becomes available on the shelves in the bookstore or the library’s lobby, books are rotated out. Most of the books are priced between 25 cents and $1. Some of them are already priced — meaning someone purchased them at the Friends Bookstore, then turned them back in to be sold again after reading them. Library Friends groups are a little like the PTA, Freggiaro said. “Instead of having a bake sale like the PTA, this is our bake sale,” she said of the bookstore. Freggiaro, who is a co-manager of the bookstore with fellow Friend Deborah Westler, was especially proud that the number of children’s books the Friends sell is much higher than it has been in years past. For Freggiaro and Westler, volunteering with the Friends has been a natural extension of a lifetime with libraries. Westler was a reference librarian in Stockton for the 49-99 Cooperative Library System, where one of her duties was conducting research for smaller libraries in the system. If a patron in Plymouth needed to know something that couldn’t be found in that branch’s books, they would call her, she said. Now she helps process and price the donated books, run the bookstore, and train new volunteers, a process that usually takes a little over an hour. Freggiaro had a lifelong library career as well, including 19-year stint in Stockton. Some of the Friends talked her into joining the group after she retired. For National Friends of Libraries Week, the group hopes to bring new people into the bookstore with special banners — and a bowl of candy at the desk. They hope new awareness will boost book sales, and maybe draw in a few more people who can commit to volunteering for a two-hour shift twice a month. “New people have new ideas, which is great,” Freggiaro said. January 1979: Friends of Lodi Public Library are organized. Original officers were Gwin Mitchell, president; Douglas Douglas, vice president of programs; Joanne Donovan, vice president of membership; Naomi McCallum Carey, secretary; Frances Welch, treasurer. Woodbridge by Robert Mondavi will hold its 13th annual Chili Cook-Off & Car Show from 9 a.m. to 3 p.m. Saturday. The goal of the cook-off, sanctioned by the Chili Appreciation Society International, is a traditional bowl of red chili. The winning cook and the top three California resident cooks will qualify to compete in the Terlingua International Chili Championship in November 2016. Admission is free, and chili tasting kids are available to purchase at five samples for $3. A portion of the proceeds will benefit the Lodi Public Library Foundation. Friends of Lodi Public Library will host a book sale at the event. The cook-off and car show will be held at Woodbridge Winery, 5950 E. Woodbridge Road, Acampo. For more information, call 209-365-8139.